My response: why doesn’t it? Our discussion that ensued gets to the heart of the conflict between environmental activists and corporate sustainability leaders. Activists generally believe that the solution to the harm we’re foisting upon the world is to deny ourselves the desire or means to commit this harm; it’s what I sometimes call “sustainability through sacrifice”. In this camp fall the folks who talk about everything from raising the thermostat to population control. Some of this is simply good practice and good business, especially when it comes to reducing waste. But drawing this attitude to its logical extreme can get very depressing very quickly, and pretty soon you’ll just want to quit everything and go find a nice quiet cabin in the woods, or become your own version of No Impact Man. From a company perspective, there’s the attitude that if we just reduced fuel, cut routes, decreased manufacturing lines, even sold fewer products — in the extreme, if we closed our doors and sent everyone home — the world would be better off. That kind of attitude makes me crazy. Even if we posit that everyone could live a zero-impact life — and I’m not sure that’s even theoretically possible — there’s no way that we could change the attitudes of enough people in time. It’s just not feasible to imagine civilization evolving past the infrastructure of roads and planes and Big Macs and iPhones that drive what we fondly refer to as “the economy” in time to make a difference within a timeframe that would allow the biosphere to recover. Besides the unreasonableness of the activist’s creed, it’s not even the best path forward for the planet: it ignores the good we can also do as humans. I’m not a Silicon Valley-climate-apologist who believes we can tech our way out of environmental degradation, but I also don’t want to ignore the positive actions we can take, such as growing responsible biofuels (algae, switchgrass) to power commercial aircraft. This, then, is the second path to sustainability, that embraced by the corporate sustainability leader: reduce what is easy to reduce, and then actively create positive impact. Switch from reducing badness to increasing goodness when the reductions become more expensive than the possible positive actions and technologies. for example, you offset a Boston-Paris roundtrip nonstop (about 3,000 lbs for currently about $20), and 100 others do as well; your offset broker might invest in a 300,000-lb sequestering wind turbine with this $2,000. The cost per pound is based on how the broker can most cheaply take a pound of carbon out of the air; this becomes a fungible “environmental currency” because, unlike fresh water or toxicity, a pound of carbon emitted or sequestered is equivalent anywhere in the world, because there’s only one atmosphere. SO: what is the harm in doubling my travel next year, if I fully offset all of it? Since I usually round up to the nearest 1,000 lbs, I might even argue that this would be slightly environmentally positive. One way I usually consider questions like this is to ask myself what would happen if everyone in the world took the same action. In this case, the result would be that offsets would increasingly become more expensive; as the “low hanging fruit” of offset projects were funded, it’d be hard to find new ones. But aside from the cost and availability, if everyone offset at least 100% of their travel emissions, I do think the world would be better off. Assuming, that is, that you believe that they are really doing what they say they’re doing. I’ve never actually seen any of the wind farms, methane captures, etc. that I’ve funded by purchasing offsets, though I have spoken with the company’s representatives (I use TerraPass) and found them to be quite above board. One also has to trust their calculations of airline emissions and of the projects’ sequestered amounts, and also trust that the projects being funded wouldn’t have happened anyway without our funding — this is a requirement called additionality. 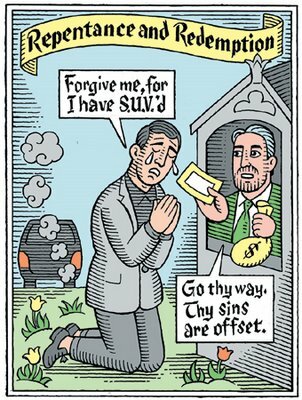 Some have compared carbon offsets with the old “indulgences” of the Catholic Church — where you could buy absolution from sins — but I’m not sure that offsetting our “sins of emission” is worse than not committing them in the first place. So the bottom line is that I really don’t feel bad for holding Gold Medallion status on Delta. I’ve purchased offsets for each one of those flights, offsets that I trust. I’d encourage others to do the same, because traveling the world is what makes it smaller, more personal, more unified, more mutually understanding, and ultimately — worth saving. 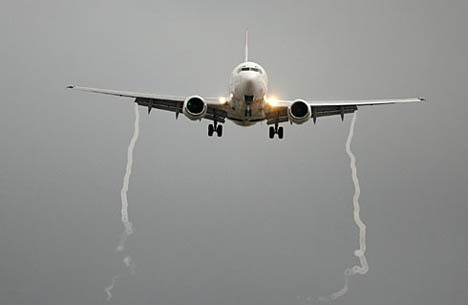 Categories: our actions and behaviors | Tags: air travel, carbon, carbon offsets, positive actions, positive impacts, sins of emission, travel | Permalink.